All photos courtesy of ManitouSprings.org. Let’s be frank, Manitou Springs is quirky, and sometimes downright weird, but that’s a big part of why I like it. We’ve done several weekend trips to Manitou over the years, and it’s always a memorable experience. In fact, if you follow me on Twitter, the blue-haired lady I use as an avatar is from a photo I took in Manitou of a pinball machine. Located just 15 minutes west of Colorado Springs, Manitou is an easy weekend trip for anyone living in the Denver metro area. It has some delightful B&Bs, the Cliff House, lots of yummy restaurants, art galleries and the Miramont Castle Museum, one of the best “house” museum tours I’ve taken in Colorado. But I’m not writing about any of that today; today’s it’s all about Emma Crawford. She died on December 4, 1891, at the age of 19 of complications from tuberculosis. She was a rather unconventional gal who believed she was spiritually connected to Red Mountain and had asked her fiancÃ© to bury her there should she die from her disease. 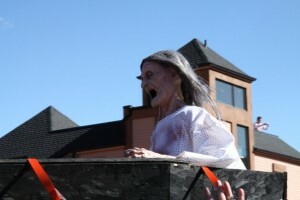 Scary scene from the Parade of Coffins. Ms. Crawford was buried on top of Red Mountain per her wishes, but in 1912 her body was removed by a railroad company and reburied on the other side of the mountain. Unfortunately, poor Emma’s remains were washed down the mountainside during a rain storm in 1929. She is now buried in Crystal Valley Cemetery in Manitou Springs, but her soul is not at rest. It is said that she will haunt the town until her body is returned to the top of Red Mountain. 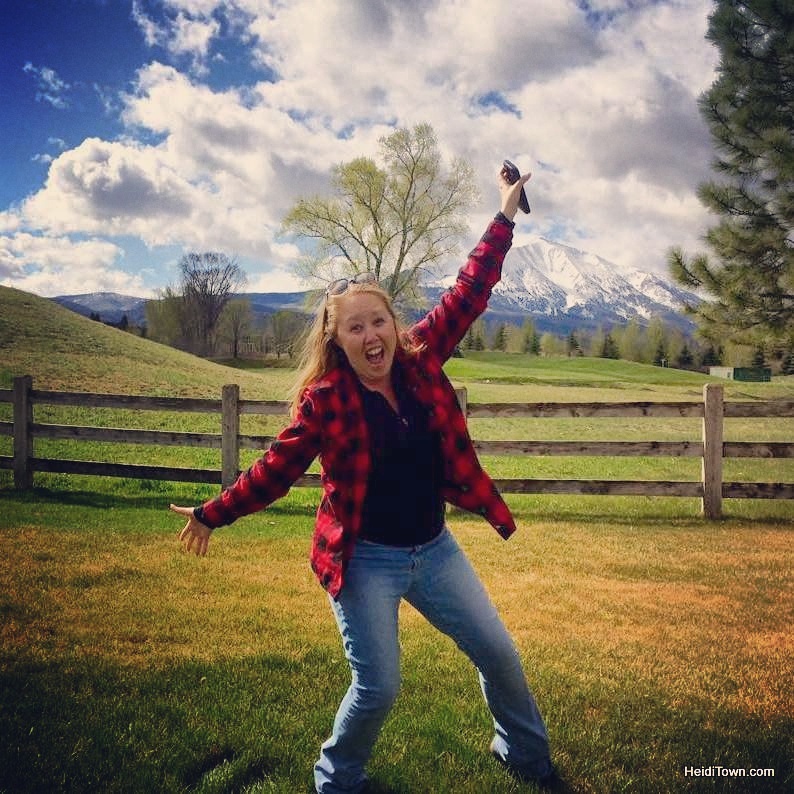 Today, Emma Crawford is celebrated annually during the Coffin Races held in her honor. This nutty event has been on my radar for quite a while, and unfortunately, I still haven’t been to it. The festivities start on Friday, October 26, 2012 with a Wake for Emma at Miramont Castle. For information and tickets to the wake, go here. The weird & wacky are on full display at this event. 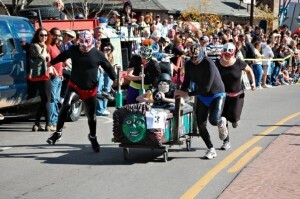 On Saturday, October 27, the Parade of Coffins starts at noon, followed by the Coffins Race. Fifty teams compete in what has become a spectacle of the spooky and the bizarre. Immediately following the races, stay in downtown Manitou Springs for the Emma Crawford Estes Sidewalk Sale. For more information on Manitou Springs go to ManitouSprings.org, like them on Facebook, or follow them on Twitter @Visit_Manitou and @ILoveManitou. The historic information regarding Ms. Emma Crawford was discovered at MyteriousColorado.com. If you like ghosts and other things that go bump in the night, check them out!